The weather is slowly, but surely cooperating. What do I mean by that? Well, we are actually getting warm weather that it feels like Chicago summer. If you’re from Chicago or have visited Chicago several times, you know what I mean by Chicago summer. Sometimes we have setbacks on days when it feels like it is going to be Winter again. I just looked at the forecast this week, fortunately, the weather is consistent (crossing fingers! It is Chicago after all!). With the Memorial Day weekend coming up, the summer season will officially start! 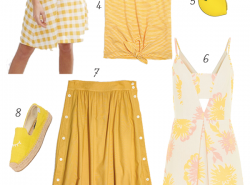 With the warm weather coming up, there are top Summer (and late Spring too) Must-Haves. This must be obvious right? I love wearing sunglasses all year round as you can tell pretty much in all of my blog posts. Not only do they protect my eyes from the sun’s rays but they also help finish an outfit or complete the outfit. 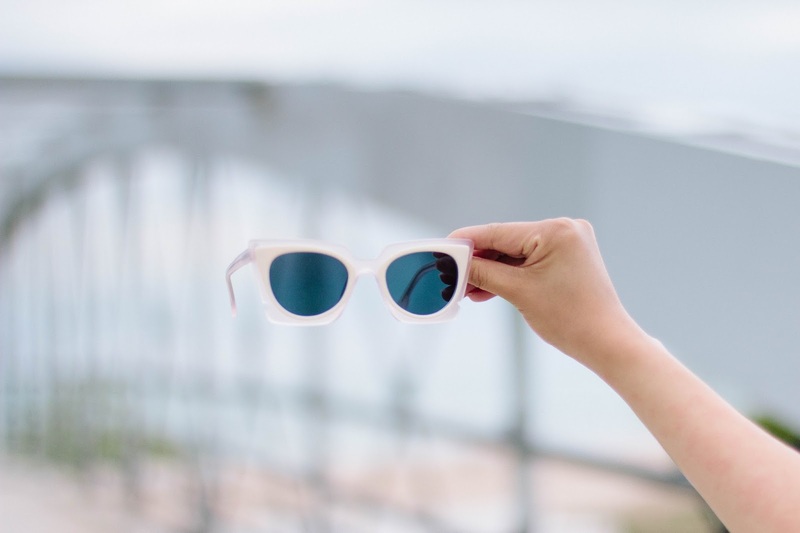 If you haven’t noticed yet, my go-to sunglasses are Zenni Optical. I just love their large variety of styles and within each style, you can customize the tint, mirror finish, prescription or not prescription, etc. The options are endless! All of that for a fraction of the cost compared to well known designer-brands. You will definitely spend less. 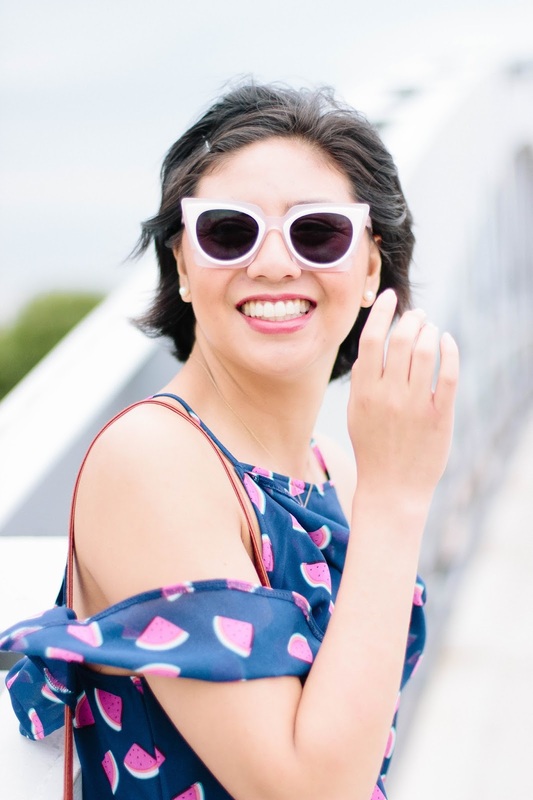 I typically go for classic sunglasses and I always wear my Tortoiseshell Premium Sunglasses. I love its classic style, it is so versatile. It looks good with any outfit! However, during the summer is when I tend to have a bit more fun with my sunglasses. After all, summer is sunglasses season. My outfits for some reason just look great if I go wild and fun. In this outfit I am wearing the Melrose’s Cat-Eye sunglasses in Pink. I just love the fun colors. Anything under the LA Collection in my opinion is so great for summer! Straw Bags and Rattan Bags are all the rage and they’re everywhere. I’m not hating! The straw and wicker usually come alive during the summer season. Think about it, there are furniture, hats, farmer’s market tote, etc that it only seems appropriate that there should be bags! I’m loving the variety of styles from clutches, crossbody bags, and totes. I scored mine at Amazon (thank you Prime! ), and have been wearing it non-stop. I just love how it goes with any outfit! Summer is all about fun and your wardrobe should be too! Time to bust out anything in prints. I’m talking about anything in lemon prints, watermelon prints, actually anything fruit printed, palm prints, cactus prints, so trendy during the summer months. 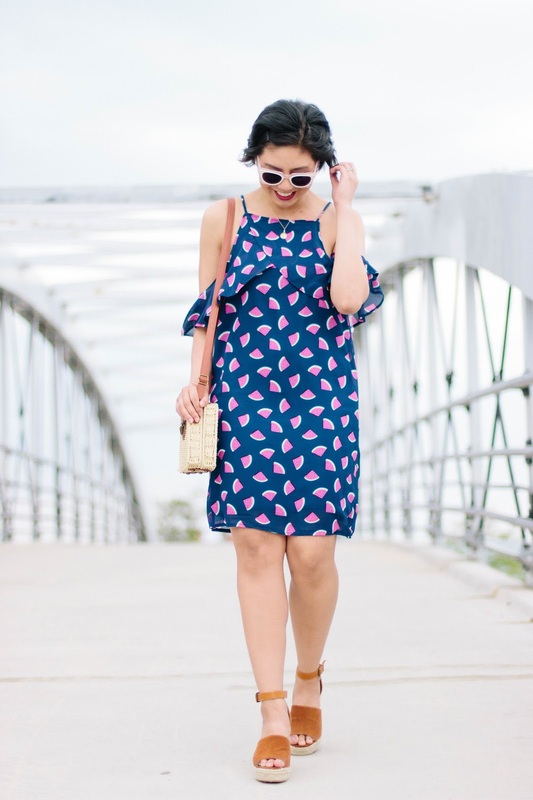 When I saw my watermelon-print dress at Francesca’s I immediately thought, this is great for Memorial Day weekend and just hanging out and grilling. Time to get those pedicures and let those feet breath after being hidden in socks and boots! My choice of espadrilles are the wedged espadrilles. They’re so versatile and I obviously think they’re cute. They look great with dresses, jeans, shorts, skirts, and the list goes on. I’m also digging the gladiator espadrilles for when I think my toes look a little too gross to be exposed haha! This is the most important but yet easily forgetten. Suncreen is something we should be wearing all year round (I’m starting to incorporate it in my skincare routine), but most importantly during the summer because that is when the sun’s rays are the most harsh. I can’t stress how important it is to protect your skin. Even if I do put on sunscreen, I forget to apply it to my face. The face is very sensitive and you have to get one specifically for the face. I’m really into Korean beauty products and their face sunscreen is AMAZING. It doesn’t have that harsh sunscreen smell or that gooey, doesn’t dissolve texture, and it’s great for acne-prone skin. It is smooth, very lightweight, and moisturizing. I love the Missha sun milk, Yadah Oh my Sun Block, and IPKN Flash cream. I am currently using IPKN Flash cream and it is amazing. It is an amazing daily moisturizer with pearl-like tint so your face has a beautiful glow with SPF! Typing out this post is making me sooo excited for the summer! I am so ready for long days, summer nights, rooftops, and grilling. How about you guys? Obsessed with that dress and your shoes! You look like an angel! That dress is literally the perfect summer print and style! So so cute and what wonderful pictures! Such fun sunnies! And that watermelon dress is the cutest! That watermelon dress is adorable! And I love your glasses!! It's so funny how our tastes can change with the season. I normally don't wear a lot of cute prints, just stripes or polka dots, but in summer I want ALLLLLLL the prints! Haha I know right?! Thanks Alissa! Ok, I 100% need this watermelon dress! It is sooo adorable!! Love those sunnies too! Yes you should! It would look amazing on you! Love that dress on you! Such a fun print! Such a cute dress! Looking great girl! This dress is so beautiful! I love the prints! I'm so ready for summer! I'm just completely over this dreary weather. I'm all about pink and white sunglasses lately too! Yours are so adorable. I am too! Thanks Heidi! I need to get a straw bag so bad! I love this one! In love with all of these pieces, especially the amazing straw bag! 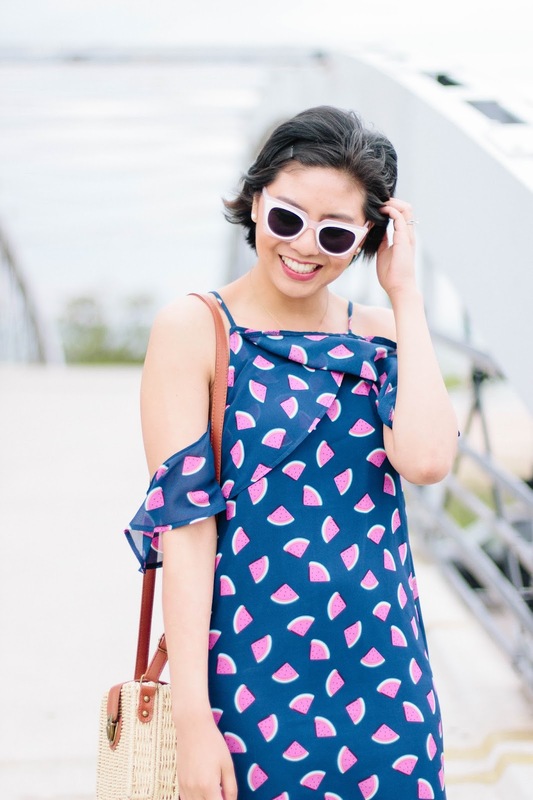 That watermelon print is adorable!! Love the sunglasses, too! We are so on the same page, Rach. I wear my sunnies all the time. I also own a watermelon print dress, lol. SPF is a must, duh. And I just got a new pair of espadrilles for the summer, and an awesome new bamboo satchel that's just as cute as yours! I LOVE my sunglasses! I also find they make a great impromptu head band when you push them up on your head haha. I adore your outfit here – that dress is absolutely fabulous! Haha so true about it being headbands! Thanks Deborah! This dress is so fun, Rach! Love the watermelon print and those wedges are stunning!!! Thank you Dora! Hope you check out Zenni Optical for your new pair! That dress is too cute! I love the print…just perfect for the warmer months! You look stunning! Oh I love your sunglasses! The pink frames are so perfect for summer. Adorable dress too. Such a fun watermelon print. Hooray for sunny weather! Thank you so much Lyndi! 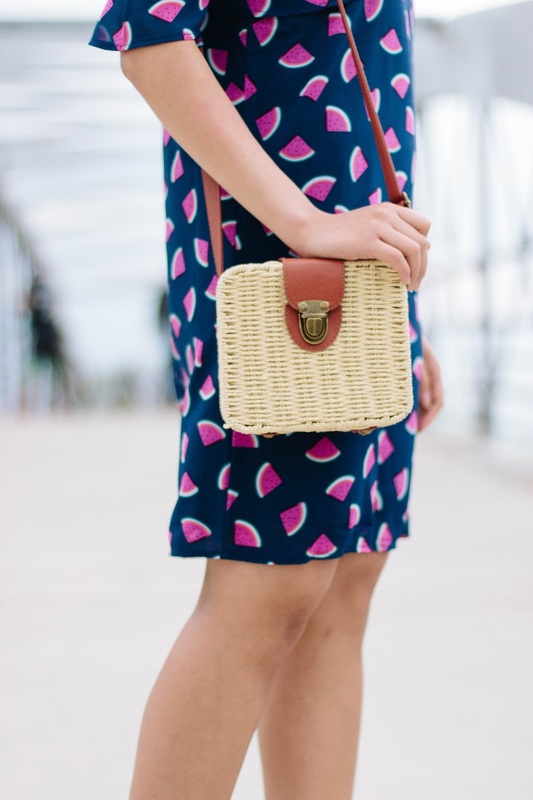 Ah yes, a basket bag, a pretty printed frock, some wedge sandals and white sunnies…perfection!! Love love love those wedges! Been looking for a good pair of wedge espadrilles, definitely checking those out! Thank you! They were definitely my favorite purchase and wayyy cheaper than Chloe! Totally love this watermelon dress…looks so cool and summery. YOu pulled it off really nice. Me encanta la sandia y este vestido es una monada, el bolso es chulísimo. Looking so fresh! Makes me miss the warmer weather. Winter is coming here in Australia. Thanks Jeanne! Oh man, I forgot that the weather is opposite there! I am loving all of the summer trends! Prints, straw bags, statement sunglasses… it all is gold! You have summer covered! Loving this fun look! The print, those awesome sunnies, and that bag! Oh and the shoes. All so good! This watermelon dress is absolutely adorable! And I love the lipstick you paired it with 🙂 so cute!! Such a cute dress! In love with this look, babe! Love the bag! Can't believe you found it at Amazon! Right?! Amazon can be such a gem! I'm so ready for summer. You just reminded me to shop for a straw bag. Yes to espadrilles and prints. Love your sunnies too! Definitely get some! Mine goes with anything! Cute sunnies are a must, these are darling! Your dress is making me so excited for Summer. It is so Americana and that print is perfect for this weekend. Love your list. Sunscreen is super important. Never heard about Korean one. Where do you purchase the one you mentioned that you love? Somehow, I always forget to bring my sunglasses with me around during the summer and it's terrible! I end up squinting and really hating myself, haha. This list will be a great reminder! you can never have too many pairs of sunglasses! this pair is the cutest! This print is way too cute! 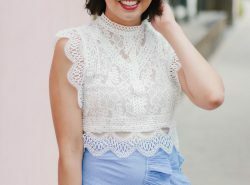 Obsessed with this cute summer look! That dress is ADORABLE! I love the watermelon print!! 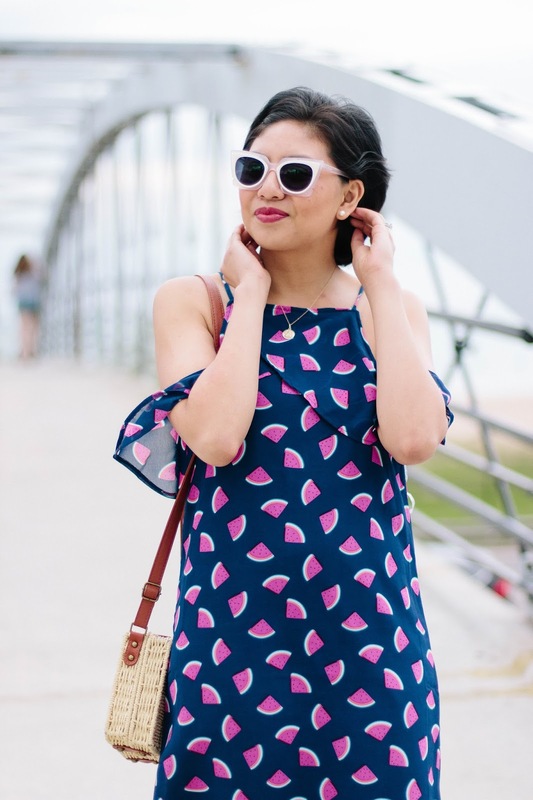 OH my goodness that watermelon print is so cute and perfect for Summer! I'm dying over your cute watermelon dress! these sunnies are so fun! Such a fun summer outfit! Love how perfectly your sunglasses fit with your face shape. So pretty! 🙂 Have heard great things about Zenni! Digging those sunnies! Also the watermelon dress is the cutest! Those sunnies are so cute! As is the rest of your outfit! These glasses totally make he outfit!! Love!